Well, this year is off to a flying start! Flowers before the concert even started! 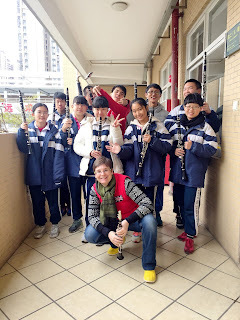 My Chinese students in Huangpu are on winter holiday but that means music camp for them. The first week was extra training for the year 1 and 2 kids. The year 2 kids played their exams at the end of the training week. Results aren't out yet but many of them passed for sure. The orchestra asked me to help out on Monday the 11th for a concert on the 15th. I said no at first because I haven't really practiced in a long time. They were pretty desperate so after some schedule agreements I went back in. When I got there it turned out that "helping out" meant playing principal. Ah.... OK then...... I was a bit scared but once we started playing it was like I never left. It was super fun to be back for 4 days. Everybody was really nice to me as they needed me there, hahaha. The second clarinet wasn't happy though and he was "sick" after the first rehearsal. A clarinet player that lives in Shenzhen was called to the rescue. Plenty of drama and 4 days was just perfect! The only bad thing to the start of this year was that Haiwen had pneumonia. He went to the hospital every day for a week and he's doing well again now. Mom and dad arrived on the 18th and were thrown into Huangpu action on the 19th. They brought their own mouthpieces and the school provided instruments for them. We are going to play in the graduation concert for the year 3 students this Sunday. I will be playing a solo with the string orchestra and after the break I will join the wind band, together with mom and dad! Guangzhou has been experiencing a cold spell so teaching in Huangpu without heating was a challenge. We could see our breath inside the classroom...... Rehearsals with the string orchestra were tough with an icicle clarinet and frozen fingers. The kids were real troopers and carried on regardless. It even snowed in Guangzhou for about 5 minutes. That is something on the tropic of cancer!